<?xml:namespace prefix = st1 />Chief Logan State Park, is in the heart of West Virginia's southern coalfields. Chief Logan State Park is four miles north of the town of Logan. 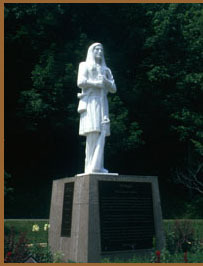 The park and town share the name of the Chief of the Cayuga Tribe (also known as the Mingo tribe). This 4,000-acre park is one of the most visited in the state park system. The park features a 25-site campground, outdoor amphitheater, and wildlife center. The recreation enthusiast can enjoy miles of hiking trails, a swimming pool with water slide, tennis courts, and miniature golf. Picnic shelters and playgrounds are found throughout the park. If you stop to visit friends or family in the Logan area and they’re not home, drive to ‘the park’, because they are probably there. This state park is a traditional park in every sense – picnicking, hiking, biking, fishing, camping and fun. Chief Logan is home to Museum in the Park. This regional cultural center showcases the best in West Virginia history and the arts. The museum offers changing exhibits and displays that feature artwork and historical items from the collections of the West Virginia State Museum and State Archives. One area of the museum is dedicated to local and regional history. For more information about business hours or to schedule a tour please call 304-792-7229. Also be sure to check out the Chief Logan Lodge for accommodations.